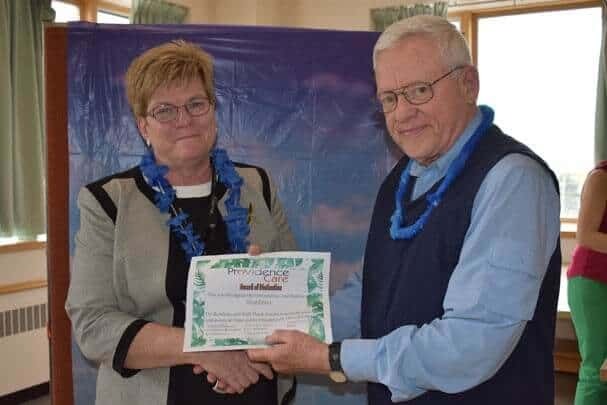 In honour of National Volunteer Week, over 100 volunteers were celebrated and recognized at an annual luncheon at Providence Manor. Over the past year, these amazing volunteers have contributed over 13,000 hours of service. The volunteers were wowed by the amazing decorations that were part of a Hawaiian theme. The food was delicious and the lunch wouldn’t have been complete without the amazing Hula Dancers that provided entertainment! A full album of photos from the day are available on our Facebook page. Volunteers were specially recognized for years of service and hours. The Award of Distinction was also presented to a volunteer who has given an outstanding contribution to Providence Manor and truly makes a difference through their Volunteer Work. This award was presented to Dave Dawes who has been a volunteer at Providence Manor since 1998. Dave Dawes first started volunteering as part of the OldTyme Fiddlers group, playing piano on various floors, to playing consistently every other week for the home on Level 4, and helping out with many special events such as our various holiday teas and special ceremonies. When asked about volunteering, Dave said he believes “each of us should share our gifts and talents, and volunteering provides an excellent opportunity to do just that.” He also says what he loves most about volunteering is “the joy and happiness in the response from the residents. For him, their response brings the music truly alive!” Dave’s dedication and commitment is a true inspiration. You couldn’t have said it better, Ruth!